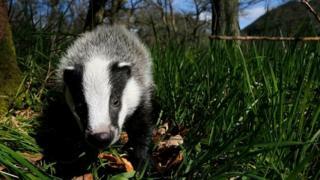 A journal of the British Ecological Society has offered to check the badger culling trials, amid questions about their scientific basis. The offer could address concerns about the lack of independent oversight of the government-run trials. The trials are to assess the effectiveness badger culling as a means to control the spread of TB to cattle. If the government deems its trials a success, badger culling will be used in other parts of England. The Department for the Environment Food and Rural Affairs (Defra) scrapped the role of an independent expert group last year which had found that the first year of culls had failed. According to Prof Rosie Woodroffe, of the Zoological Society of London, Defra has given very few details of how it proposes to assess the effectiveness of the culls. "I suspect they are doing it on the cheap," Prof Woodroffe told BBC News. "That is why there is concern that the answer they get will not be robust". A Defra spokesperson told BBC News: "The minimum numbers for this year's culls were set using the best available evidence gathered by local experts and the approach was signed-off by Defra's chief scientist. "We will publish all the data and results of this year's culls once the quality assurance processes have been done and the independent audit has been completed." Defra referred BBC News to details of how it set out the number of badgers to be culled in the second year of its trials which is on its website. The government began two pilot badger culls in Gloucestershire and Somerset last year to assess whether enough badgers could be killed to control the spread of TB to cattle. Earlier research had shown that unless 70% of badgers in an area were killed there would be a risk that TB infection in cattle could actually increase because the culling caused an increase in the movement of badgers. The proportion of badgers culled in each area was assessed using a high-tech method which involving analysing their DNA. The results were then assessed by an independent group of experts. BBC News learned that the expert group found that marksmen failed to kill enough badgers in both areas. It also found that the culls failed to meet the criteria for humanness set by the government, too many badgers took too long to die. Because of the failure of both trials, the scheme was not rolled out to other parts of England as many of the policy's supporters had hoped. The trials in Somerset and Gloucestershire did continue as Defra ministers vowed to learn lessons and improve its culling methods. But Defra scrapped independent scientific oversight of the trials in its second year which were completed two weeks ago. It also announced that it would change the method for assessing the proportion of badgers killed . The department and its ministers were consequently accused of "wilfully" ignoring the scientific advice. Prof Woodroffe is concerned that if the methods that are now being used to assess the effectiveness of the pilot culls are unreliable, Defra might roll out a policy that will increase the spread of TB in cattle in England rather than stem infections. "Under these circumstances one would have hoped that the government would be adhering to the highest standards of scientific evidence," said Prof Woodroffe. "But by not only rejecting, but fighting two legal cases to defend their right to reject independent scientific oversight does make one wonder why they care so much about not having independent scientific oversight." Last week in the Commons, the UK's Shadow Farming Minister, Huw Irranca-Davies, joined those calling for an independent review of the methods being used to assess the outcomes of the ongoing pilot badger culls in England. In response to such calls the British Ecological Society's Journal of Animal Ecology has offered to assess the methods used in this year's trials for Defra for free. In an open letter, the senior editors of the journal offered to provide a "transparent and independent review of the available evidence using our extensive international network of reviewers, comprising scientists with acknowledged expertise in wildlife population monitoring and management, as well as expert statisticians and modellers". The editors, Profs Ken Wilson, Jean-Michel Gaillard and Ben Sheldon said that they would personally handle the reviewing process and draw on their team of associate editors and external reviewers. The department is currently analysing the results of the second year of its culls and is expected to publish its assessment of whether they have failed or succeeded in the next few weeks.